Underlayment is used beneath all types of flooring -- including carpet, linoleum and hardwood -- to create a flat surface before the flooring material is installed. Correctly installed underlayment prevents common flooring issues, such as warping or cracking wood or linoleum. If you want to install your own flooring, you can install your own underlayment as well. 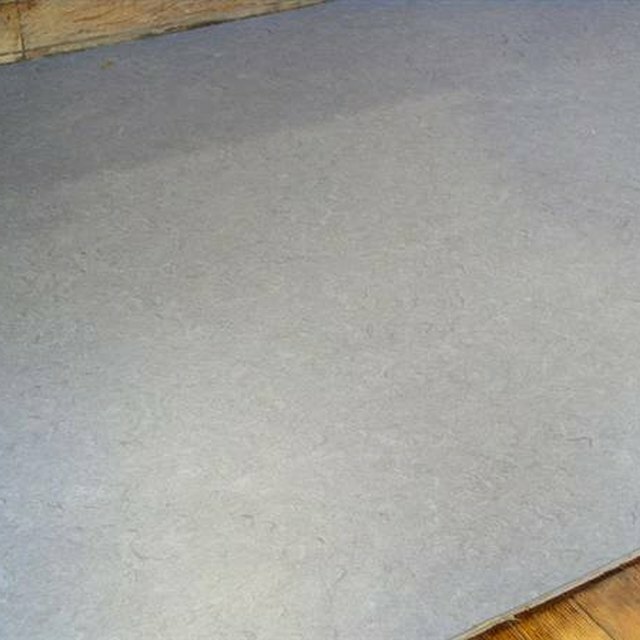 Underlayment provides a level base for your floor covering. Measure the room with a tape measure to determine the number of 4-by-4-foot underlayment panels you'll need. Underlayment is usually sold in 4-by-4-foot panels, so if your room measures 100 by 100 inches, you need 25 panels in each direction. To get the total number needed for the floor, multiply 25 by 25 for 625 total panels; but since you aren’t laying them in a checkerboard pattern, extra panels will be needed, making 700 a better number for a 100-by-100 inch room. Design your underlayment layout. According to Better Homes and Gardens, do not create a checkerboard, where four boards meet at the corners. Instead, cut some pieces of underlayment down with a hand saw so that the alternate rows of underlayment are not directly lined up. Nail the underlayment into place with ring-shank nails and a hammer. Nails between 1 1/2 and 2 inches should be sufficient to reach through the underlayment and the flooring. Space the nails every 4 inches around the perimeter of the underlayment design and every 8 inches throughout the rest of the room. Cut edge pieces of underlayment with the hand saw if the underlayment pattern does not reach the walls. Use the underlayment already in place as a guide to cut a piece of underlayment in the correct size. Place the edge pieces of underlayment into position along the perimeter of the room. Nail the underlayment into place with a ring-shank nail every 4 inches. Hammer all of the ring-shank nails down so that they are below the surface of the underlayment, making a slight indentation. Fill the indentations with floor putty, allow the putty to sit until dry to the touch and then sand down until the floor is completely smooth.